Some of the best fiction, in my opinion, are stories that can transcend genres. They can explore many elements of the human condition and explore real hopes and fears even in the most extraordinary circumstances. NanoMorphosis accomplishes such a feat. I bought a copy of this sci-fi novel by Marla L. Anderson earlier in the fall because of the intriguing premise it offered. Anderson did not disappoint in delivering an an engrossing and engaging sci-fi tale. 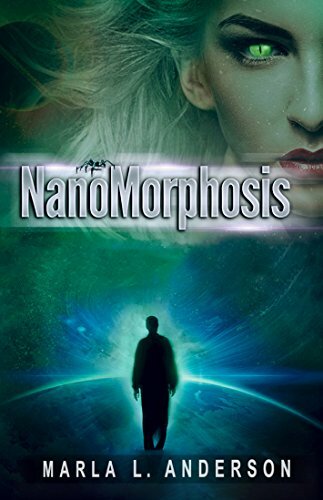 NanoMorphosis introduces us to Daniel, the sole survivor of a brutal attack by a dangerous alien species, who is chosen to head up a deep space mission to find a new homeworld for humanity. Earth is beset by a depletion of natural resources and a nanovirus plaguing the planet. Daniel must deal with opposition from foes like the United Church of Earth who believe that leaving Earth for a new home elsewhere in the galaxy is an affront to God. He also must worry about the agenda of Cadmon, a carrier of a disfiguring ‘toad’ virus who is searching for a cure to his condition, that threatens to destroy Daniel and his mission. An incredible depth of detail that goes into building the world of NanoMorphosis. It starts with an compelling premise and creates exactly the right amount of suspense to keep you turning the pages. Cadmon is equally tragic and horrifying as an antagonist. You also feel empathy for Daniel in his single-minded pursuit to finish the work his parents started and confront his own demons from his tragic past along the way. This is a unique and imaginative sci-fi tale driven by realistic characters. Marla L. Anderson has the ability to make extraordinary situations feel believable and is skilled in painting a chilling future that explores the best and worst of humanity, like all good science fiction stories can do. A definite must-read for sci-fi fans.